When I learned that The Enquirer was eliminating the TV/Media beat late last year, I jokingly asked my old friend Howard Wilkinson: Is there an empty desk at WVXU next to you for me? Before I left the Enquirer/Cincinnati.com in December, Cincinnati Public Radio President Richard Eiswerth let me know that he’d be interested in my services, if I was. And so here I am. 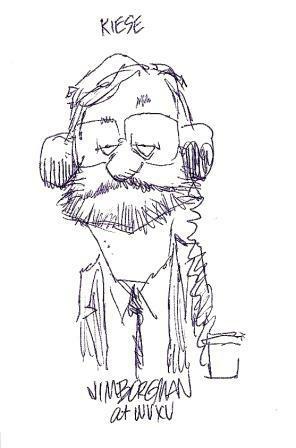 WVXU was the perfect place for me to resume my blog, now called John Kiesewetter: Media Beat. I’ve been a longtime listener, and have helped on some fund drives – and have the Borgman cartoon from 1992 to prove it, as I said in the announcement yesterday. I’ll do my best to fill you in on the comings and goings of Cincinnati TV/radio personalities – like the TV news director who’s out, the anchor who moved to Detroit, and the reporter/anchor who left TV for a public relations job. But I’m getting ahead of myself. Watch for my next blog posting catching up to all the changes from the last six months. You’ll also hear me from time to time on the 91.7 and 88.5 airwaves, online at wvxu.org and wmub.org, and on the station’s free mobile app -- starting today on “Cincinnati Edition” with Mark Heyne at 1:30 p.m. Thanks for all the kind words since Monday’s announcement. Thanks to WVXU. It’s great to be back.